As a way of saying ‘Thank you’ to fellow bloggers, littlegirlstory has come up with a list of recommended ‘Must Read’ post from the blogs she follow. 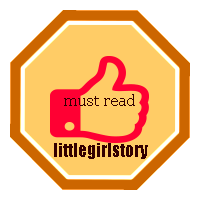 The nominated posts are awarded ‘littlegirlstory MUST READ’ badge which can be displayed alongside the nominated post. This page is dedicated to the bloggers community and any readers who wish to promote their blogs are kindly invited to write a short introductory and provide the URL in the comments below. This is an interactive page where bloggers promote and share their blog or just a particular post for the reading pleasure of other bloggers. Providing your links here do not automatically earn you the ‘littlegirlstory MUST READ’ badge. Only posts nominated by littlegirlstory are entitled to the badge. This is a raw original idea by littlegirlstory. All rights reserved. Thank you, Alienora for kick starting this thread. To all readers, this is a MUST READ post of a mother’s feelings, love and connection with her new bundle of joy, her precious son. This is a good original idea! Thanks are you a fan of his? Awesome. Readers check it out ! Hey everybody, here is a humor blog where I try to validate my existence by making life activities like installing new ovens and stealing library books seem vaguely interesting. You, too, can validate my existence. Sweet idea and very helpful for new bloggers like me to get our voices heard. Here is the link to my latest post about my childhood boogeyman. Would love your thoughts on it. Looking towards to reading all the other links posted here too.. Excellent post. Certainly made it to my littlegirlstory MUST READ list. I have commented on your blog. Well done. A post of mine chosen at random, I hope you like it. I love what you’re doing here. I’m attempting a post a day telling my story about relationships, friendships and tough life lessons. I have read your story and commented. Thank you for sharing. Interesting idea 🙂 I actually have 2 blogs..one is about my teaching…kiddo say and do the funniest things..as well as being frustrating at times. The 2nd blog, not too much on it yet, is mainly a place for poems that I write (not that I am a pro on them) for various reasons. Thank you for sharing your blogs. I clicked on your 4cornerteacher but there was nothing on your ‘About’ page so perhaps you may want to share something there and I am sure the students would love to read your stories. There should be one on the poems.. I will check it out. I did have some problems with it at the beginning. I will add the about stuff. Thanks! I have corrected your links as listed above. I have been to read your poems, Melissa. What a lovely idea, and excellent way to give back! Please feel free to check out my blog – either way, I commend you for your thoughtfulness. This is a lovely idea, a great way to get involved with fellow bloggers! My blog is almost two years old now, but is still fairly small. I write about a variety of topic stemming from my interest in history, but also look at current events and social trends. Any thoughts on it would be great. HI! I’m quite new to this and trying to be a teacher/life ramblings blog. I’m just really worried that my writing style isn’t very good or I’m doing toO much so any feedback is great. I always start off thinking my posts are going yo be great and depthy but never end up feeling that way when I’m finished! i like this idea as well. i don’t think my blog is great enough to be featured as a ‘must read’ but maybe i can get some suggestions. Thank you for visiting and for leaving your link. I publish a “must read” list of bloggers I follow once in a while. I am sure there will be some interesting posts I can find from your blog. Going to check it out now.